Dear Sir, We are very pleased clients of Glen-L from Istanbul, Turkey. We just finished our latest boat from your plans of Double Eagle project. This is the second Double Eagle that we completed in Istanbul. Also we made two Kodiak's too. We made our boats with epoxy laminated marine plywood then fiberglassed the hulls. The original hull was extended by %10 to around 25 feet. The lay-out was a little bit modified as you can see in the pictures. There is a closed headroom in the cabin with a galley and v-berth. 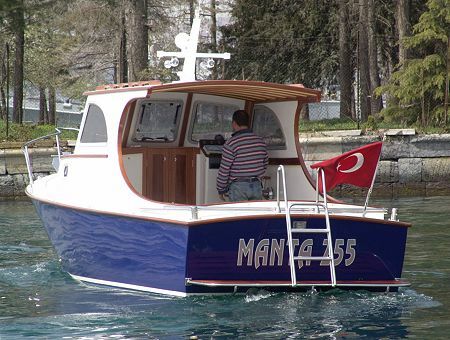 We choose Yanmar 55 hp diesel that forces the boat around 12-13 mph. The displacement of the boat is 2600 kg. with 140 L. of fuel, 100 L. of water and 50 L. of waste water tanks. We used high solid polyurethane paints and varnish. All the major woods are sapelli and iroko. 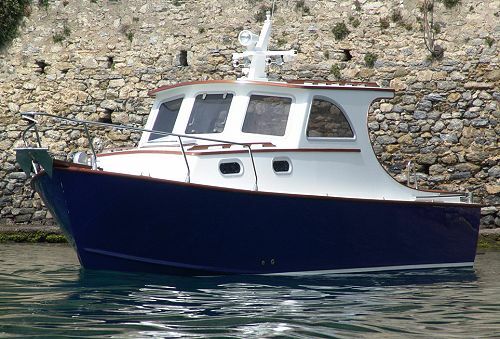 Finally we had completed the boat in five months time.